This is a little geeky, but in the days leading up to the Fourth of July I've decided to dress in red, white and blue. Whenever an outfit in this color scheme comes together in my mind, I think "Well, thats a little 4th of July-ish" and change something. So, over the next few days I'll finally wear all those patriotic ensembles that I've deemed too festive for just any old day. You look so cute like this, and not at all costume-y. Even with the scarf, I think you could wear this on non-patriotic holidays. Love the jumping pic! This post makes me wish I was doing something July 4th! This is such a cute outfit! That skirt is wonderful. I'm the same way with red white and blue outfits - I tend to decide against wearing them out of fear of looking too patriotic. I should join you and take advantage of this opportunity! I love that you're using the upcoming holiday as an excuse to try out all your red, white and blue outfits. It's such a great color combination! I find myself wanting to wear it often too. 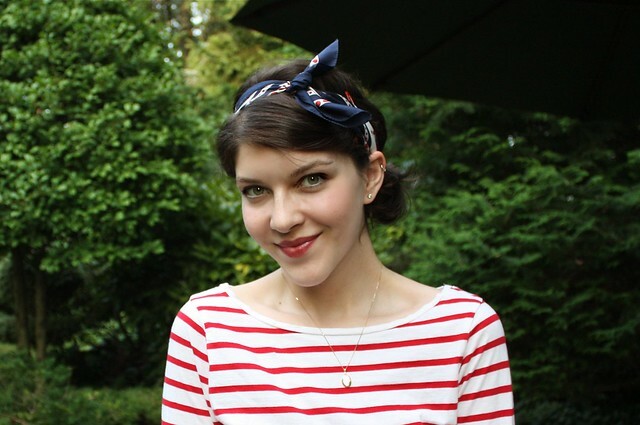 The scarf you have on is so cute, and that is the perfect striped shirt - I really like the sleeve length. What a jump looks like your levitating. 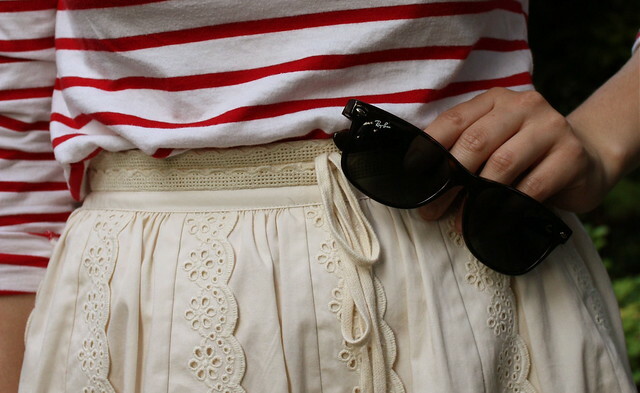 I love this 4th of july inspired outfit! wow, so nice!love the stripes! Your jump shot looks so cool and I love the striped top and the scarf. you look so cute and not overly patriotic either. that skirt is really pretty, a perfect compliment to the rest of the outfit! I think it's cute to adopt a timely color-scheme. And are you levitating in that first picture?! Red, white and blue is my favourite colour combination! And, it may feel patriotic for you, but it is still great! And you skirt is super lovely. 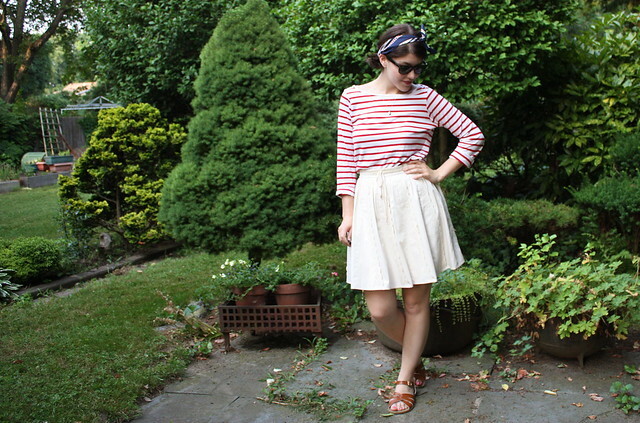 This is such a cute fourth of July weekend look - I love the red striped top! So in love with the headscarf! Really lovely. 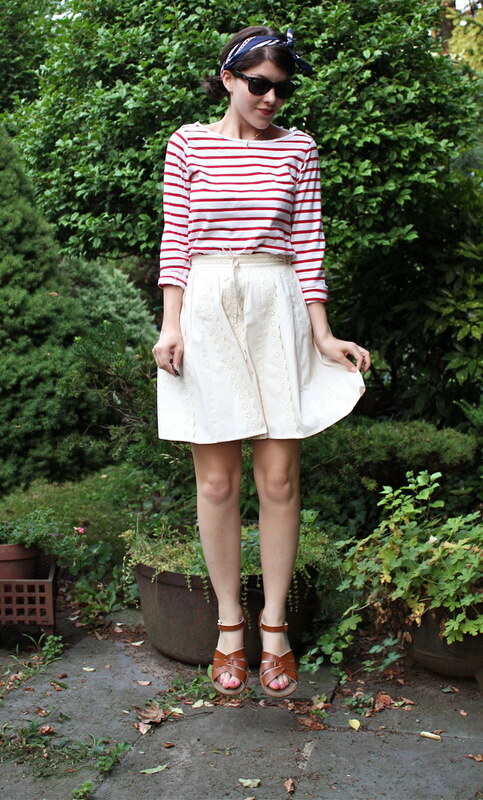 The sailor look is great on you. Aww! You look so adorable! Super cute skirt! I dont think you looks so patriotic, it is not like you are wearing the american flag. But I do think it looks cute. not being an "native american" ;) i usually smile and smirk at all the patriotism and the stars and stripes obsession! but i love your outfit and i planned my america trip so i could be there for july 4th :)) Itll be my first one and i ant wait ti fly there tmrw! you look just darling in this outfit! I don't think this looks too festive at all! It's adorable and perfect for any summer day. I especially love your skirt and the cute scarf you tied in your hair. No actually just kidding I am wearing red, white & blue too. You look gorgeous in fact. That last photo should be framed. OH MY GOD I just read Shybiker's comment. How did I not see you were floating in that first picture?? That is amazing. I just want to stare at this outfit, forever. red white and blue and awesomely nautical. Uh. your skirt is devine and can we talk abut how you manage to jump up and still look so awesome. I tried this once....and looked like a baboon. That is one gorgeous skirt. How do you like your Saltwater Sandals? I was thinking of getting a pair. Goodness, you are incredibly pretty. What a darling outfit! Way to get in the spirit of Independence Day! The Betsey Johnson skirt is unbelievably cute. And the striped shirt is perfection. This outfit screams Americana! I love that the skirt is cream instead of white! It looks so ladylike on you.